The Washington Apple Commission has suggested access to the US market be given to Chinese apples, to aid the return of US apple access into the Chinese market. The organisation adopted a motion to make the suggestion last week, on the condition the US Department of Agriculture (USDA) and the country’s apple industry is satisfied there are no insurmountable pest or disease issues, reported Capital Press. That motion will now be passed to industry trade organisation the Northwest Fruit Exporters (NFE), which will make a decision on whether to send the recommendation on to the USDA. “I have met with Jim Archer `NFE manager` and one of his board members and don’t have a clear indication if it will be passed on or not,” Todd Fryhover, president of the Washington Apple Commission, told Capital Press. The recommendation is a change in heart for the Washington apple industry, which had previously been opposed to Chinese apple access for many years. The industry had feared China’s high volume and low-priced Fuji apples could swamp the US apple sector. But the higher prices of Chinese apples in recent seasons has reassured the Washington industry, said Fryhover, combined with the failure of Chinese Fujis to catch on in the Canadian market, where they have had access for some years. Granting US access to Chinese apples is expected to help US apples gain access back into the Chinese mainland market. The US gained access to mainland China for the Red and Golden Delicious varieties in the mid-1990s, but it was suspended in August this year when Chinese authorities ceased issuing permits, reportedly based on rot problems in US apple arrivals. 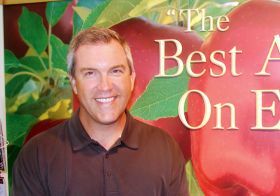 Regaining access to the growing mainland market is critical for Washington’s growing apple production, Fryhover said. China imported 408,000 boxes of Washington apples in 2011/12, and Hong Kong imported a further 2.1m boxes. Chinese officials are in Washington this week inspecting orchards and packhouses, and industry figures are hoping the visit will help speed along negotiations. “They will take the better part of `this` week reviewing and inspecting on their disease concerns and then we’ll all wait to hear on a decision,” Dr Michael Willett of the Northwest Horticultural Council told Asiafruit.